You will like this album if you find its title amusing. Only four lines into his new album, Jason Mraz sings, "There is no end to what I'm saying." Only four lines into his new album, I believe him. Certain albums demand that you respond solely to the music. Instrumental jazz tends to do this. Other discs draw you into the lyrics. Here we find the clumsy-but-heartfelt folkies. Yet another group requires you appreciate the artist's personality, or the presentation of their character. Mr. A-Z presents Jason Mraz (or a believable facsimile thereof), and how you respond determines how much you can enjoy the album. Not since my nightmare about the mythical Alanis Zeppelin have there been such words pretending to have meaning while being devoid of any value save for use as sig files on mommy blogs. Then Mraz says his speech is unending and I hit the skip button. Well, I don't, actually, but it would have been better if I had. Which brings us to "Wordplay", which I can't convince myself is ironic, or clever, unless it's self-congratulatory-clever, which most clever is (like this sentence -- see how it feels?). Ostensibly, Mraz sings a paeon to his own rhetorical dexterity, delivering his lines rappishly but ridiculously. Rarely have I been so irritated by a song performed by artists without a "Ying" or a "Yang" present. "The Mr. A to Z they say / Is all about the worldplay". They do? Who? "The sophomore slump is an uphill battle / But someone said that ain't my scene". Now I know who the "someone" is this time -- it's himself! And what he means by "sophomore slump" is when one fails to pick up sophomore girls in coffeeshops, so moving on to first-years. Actually, I feel a little bad that Mraz's songs are bringing out this catty side of me. I shouldn't be scaring people away, because his music's so harmless. I'll be shocked if something of this album -- take your pick of tracks -- doesn't enter standard rotation on at least half of the Starbucks in the area. Maybe they'll even sign him to an exclusive remixer deal. So, yeah, that's what it sounds like -- a guy with a gentle guitar and then a band (he somehow gets ?uestlove to show up for a track) and he does that whole sound. Despite my disdain for this album, I'll end on a well-earned positive note. 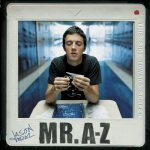 Mraz's "Please Don't Tell Her" suggests that Mraz could turn his clevercentric bent to good use. On this track the singer glides in and out of the front he puts on after a breakup. Initially vindictive, then vulnerable, then in track-covering mode, Mraz takes us through the mentality of a guy too concerned with being tough to hurt, but too hurt to maintain the hard facade. On this piece, Mraz uses his cleverness not to display his alleged prowess with words, but to smartly draw a portrait that works on our intellect without forsaking the emotional tint. Mraz apparently has some skill, and maybe if he gives up on showing that skill off, his next record could be a respectable one.